Beneath the streets and all along the estuaries of the San Francisco and San Pablo Bay region lie ancient remnants of the daily and sacred lives of California’s native peoples. Pavement and buildings now mostly cover what used to be hundreds of shellmounds — gently rounded hills formed from accumulated layers of organic material deposited over generations by native coastal dwellers. Often the sites of burials and spiritual ceremonies, these shellmounds are still places for veneration. But preserving the remaining shellmounds has proven to be a contentious issue among developers, indigenous rights groups, preservationists, and local governments. In the latter part of the 20th century, activists began working to protect remaining shellmounds and honor leveled sites where the commerce of modern life is conducted atop the graves of the Bay Area’s native peoples. Since 2005, organizers have sponsored a 280-mile shellmound prayer walk, lasting between 10 days and thee weeks, that visits several sites in the nine-county Bay Area region. The walk is primarily organized by Native women, and many in the Bay Area Native community participate in the walk, though walkers have come from as far away as Australia, Japan, the Cape Verde Islands and Nova Scotia. Some of the sites visited by the prayer walkers are already entombed under retail strips, others are protected, and still others are facing development pressure. During the 2010 prayer walk, one of the sites under the most scrutiny was the Sogorea Te shellmound in the city of Vallejo, located on 15 acres in Glen Cove Waterfront Park. The shellmound is 3,500 years old, and use of the site as a village and burial ground has been dated to 1,500 B.C. Like most shellmounds, it was leveled in the early 1900s by private property owners; the land was eventually deeded to a municipal agency for parkland. Plans now call for a $1.5 million low-intensity development to include picnic tables, a parking lot, a bathroom, and links to a network of Bay Area trails. Invasive plants will be eradicated and an old home on the property will be razed. The plan also calls for “capping” the identified shellmound site with a layer of soil and installing plaques describing the land’s history. The proposed work would be conducted under the observation of a state-designated indigenous representative, who has already given his approval of the project. Work on the park was slated to begin in October 2010. But groups like Sacred Sites Protection & Rights of Indigenous Tribes and Indian People Organizing for Change (IPOC) oppose the plan and have been voicing concerns since 1999 about various attempts to develop the site. Indigenous activists instead ask that the entire site be undisturbed to protect the remaining shellmound and the environmentally sensitive wetland. They also ask that artifacts and remains removed during archeological digs be returned under the Native American Graves Protection and Repatriation Act. The University of California at Berkley, for example, houses approximately 13,000 ancestral remains from shellmounds like Sogorea Te. Greenaction, a San Francisco environmental-justice nonprofit, has partnered with organizers to draft a unity plan. Organizers are also searching for a lawyer to file an injunction against construction. As of December 2010, construction had not yet begun while a permitting issue awaits resolution. The Sogorea Te shellmound is just one of what used to be over 400 shellmounds clustered along the estuaries and inlets of the region, some acres wide and several stories high. The shellmounds were left by peoples of the Oholone, Patwin-Wintun, Bay Miwok, Coast Miwok, North Yokut, Wappo and South Pomo nations, a busy community of people who lived, traveled and traded all along a coastal landscape that provided plentiful resources. Over time, the activities of daily life — eating shellfish, making tools, cooking, butchering animals, building shelters — led to the accumulation and compaction of tons of shells and other material in sloping mounds of rich soil. Generations of coastal dwellers returned to these shellmounds again and again, using the sites to bury ancestors — a way to intertwine their daily lives with the afterlife. When European colonizers first came to the Bay Area in the 18th century, the shellmounds had been abandoned for hundreds of years, likely the result of an extended drought. But the shellmounds still retained their cultural significance and were visited and revered as sacred ancestral burial grounds. As the San Francisco Bay Area urbanized in the 19th and early 20th centuries, most shellmounds were razed for development, dug up for their rich topsoil, looted by artifact seekers, and excavated by archaeologists who catalogued the relics in museums or university archives. Today, there are no shellmounds in the area that haven’t been desecrated in some way. The Emeryville shellmound, north of Oakland, is perhaps the most publicized example of how these burial grounds fared as the Bay Area developed. Associated with the Ohlone people, it was one of the largest shellmounds in the region. In 1876, the site was partially leveled for an amusement park; when the park closed in 1924, archaeologists excavated more than 700 indigenous graves. The site was then razed to build an industrial plant that occupied the site until the late 1990s, when the city demolished the buildings and started cleaning up the toxic soil left behind. During that process, hundreds of human remains were found, some of which were reburied while others were taken to landfills or incinerated as part of the cleanup. Activists attended city council meetings to ask that the site be cleaned and allowed to remain open space and a place to honor ancestors. Construction continued, however, and was protested by groups like Indian People Organizing for Change, which now organizes the annual shellmound prayer walk. The site was ultimately developed into the Bay Street Mall, a mix of retail and residential buildings. An unknown number of bodies are still interred under the three blocks of stores and apartments. Tucked in the rear of one of the stores is a small monument to the Ohlone shellmound. Every year on the day after the Thanksgiving holiday, the annual shellmound prayer walk ends at Emeryville, where activists hold a protest to educate consumers about the burial grounds beneath their feet. All across the Bay Area, many shellmounds are now hidden underground, with nothing to identify the significance of the sites. Some, like the West Berkeley shellmound, which is beneath parking lots and commercial businesses, have received historical landmark recognition or some other form of identification. A few others, like the shellmound at the base of San Bruno Mountain, just south of San Francisco, or the shellmound in Coyote Hills Regional Park in Fremont, are protected from commercial or residential development by land-use designations. But these protections are hard-fought and take years to resolve. In the case of the San Bruno shellmound, it took a legal suit by environmental groups and a coalition of funders to stop commercial development on the site and raise the $1.3 million necessary to purchase the 25-acre property through a land trust. At the Sogorea Te shellmound at Glen Cove, activists and organizers have staged several peaceful protests, hoping to stop the arrival of the first bulldozer. They continue to negotiate with the city to halt development plans so that the spirits buried there can be granted the respect and peace appropriate to ancestral burial grounds. Stay current with new developments and future activism at the Sogorea Te shellmound via the Protect Glen Cove website. 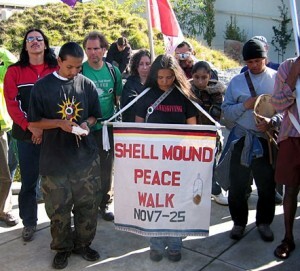 Join the annual Shellmound Peace Walk or make a donation in support of the walkers. Learn more at Indian People Organizing for Change. Albert, Mary. “San Bruno land set aside: Site was once used as Native American burial grounds.” San Francisco Examiner, September 10, 2004. Becker, Leonard. “San Bruno Mountain Shellmound.” Sacred Sites International. Buchanan, Wyatt. “Conservationists buy land in San Bruno.” San Francisco Chronicle, September 10, 2004. Burchyns, Tony and Rachel Raskin-Zrihen. “Emotions run high in dispute at tribal burial site in Glen Cove area of Vallejo.” Vallejo Times-Herald, November 12, 2010. Del Vecchio, Rick. “Emeryville: Filmmaker tells story of forgotten Indian burial ground disrupted by quest for retail.” San Francisco Chronicle, March 25, 2005. Dury, John and Laird Townsend. “Shellmound at San Bruno Mountain: Historical Essay.” Found SF. Greater Vallejo Recreation District. Final Glen Cove Waterfront Master Plan. August 2007. Indian People Organizing for Change. Jones, Carolyn. “Indians: Vallejo’s plans for park desecration.” San Francisco Chronicle, March 13, 2010. National Park Service. “Process established for disposition of Native American human remains.” News release, March 15, 2010. Rahimi, Shadi. “Glen Cove burial site slated for development.” Indian Country Today, December 23, 2009. “The Emeryville Shellmound.” Sacred Sites International. Shellmound. DVD. Directed by Andres Cediel. 2005. Berkeley, CA.